This individual Report Thin File And Global Credit Scoring is available for purchase. This Report is available to members of Mercator Advisory Group’s Global Payments Advisory Service. Please be advised that this Report is normally part of a research and advisory service that provides ongoing support throughout the year. As such, this Report contains significant depth of content that is selected for its strategic importance to our members. (For a description of these services, see our Advisory Services section). As issuers look for opportunities to grow credit volume, they are increasingly interested in reaching untapped markets. In the United States, the 'thin file' population has traditionally been ignored due to limited or non-existent bureau data. Internationally, especially in embryonic markets, there is a lack of substantial financial data with which to assess the creditworthiness of potential customers. "The importance of addressing consumers with a limited credit profile is increasingly a focus for solution providers and global issuers," states Melanie Broad, Analyst in Mercator Advisory Group's Emerging Technologies Service and author of the report. "The ability of credit issuers to offer their product to a broader portion of any given population is imperative for continued growth in credit volumes and market share." The report takes a broad look at the issues such as data standardization and the availability of positive and negative information that influence credit scoring in he US and around the globe. In the US emerging products and solutions from companies including Fair Isaac, PRBC, VantageScore and eFunds are examined with an emphasis on their ability to score 'thin file' customers. The report goes on to evaluate the solutions that providers are offering in global markets, and the problems encountered in developing global scoring solutions. Many of the solutions available to global issuers are examined along with an analysis of some of the key limitations to a unified global scoring metric. In order to highlight the opportunities and difficulties involved in promoting credit in a new region, the report specifically drills down into the Asia-Pacific market with particular emphasis on the market for credit in China. 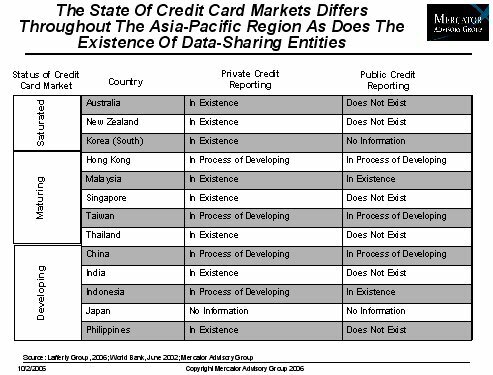 The research evaluates the current state of the Asia-Pacific market while also showing the beginnings of credit bureau development in such countries. The report contains 29 pages and 3 exhibits.